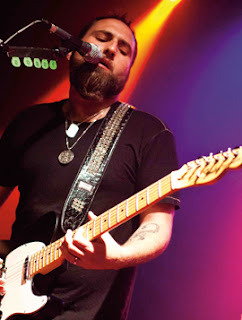 For as long as most people can remember, Monte Pittman has always had a great singer in front of him. Tommy Victor (Prong) as a phenomenal poet. Adam Lambert with his amazing vocal range. Chris Sheehan (Myra Mains) as one of the finest frontmen. And Madonna, who is best at being Madonna. It has always been that way for Pittman, a Texan who took a chance on California to start a music career at the age of 24. Like many young musicians, he found work where he could, first at a local guitar store, and then as a teacher. He still might still be teaching if it wasn't for his third student. British filmmaker Guy Ritchie had just received a guitar from his girlfriend and then bought one for her in return. In less than a month, Madonna would invite Pittman to help promote her new album, Music, on the Late Show With David Letterman. That was almost ten years ago. Today, Pittman has the mic. "I started playing solo and taking it seriously when I realized I could only count on myself," says Pittman, who recently released his second full-length album. "That's kind of like how James Hetfield started singing in Metallica. It's got to be somebody." His album — Pain, Love & Destiny — is an eclectic mix of pop-rock with a much fuller sound than his first album, The Deepest Dark, a mostly acoustic outing. But don't mistake the change up as anything settled. Skipping across all 14 tracks, it becomes pretty clear Pittman isn't locked to a sound. "I'm letting it build from the ground up naturally," he says. "I'm in this for the long haul." What he has decided is that he intends to rely on songwriting more than the guitar work for which he is best known. And for the most part, that works. The finest tracks from Pain, Love & Destiny are all dynamic, with songs that never drift into the predictability of straight pop. The best track off the album is (I Am) The Black Rabbit inspired by Watership Down, much like the cover art. The 6-minute plus track — which does include the finest guitar solo on the album — carries a more somber note as it captures Hazel's loyalty and loneliness along with the forbidding black rabbit (a.k.a. grim reaper). Other standouts from the album include Fortune, The Price of Fear, and Definitely. All three explore the challenges and opportunities faced in the midst of change. But there is a little more to these songs for an artist who tries not to pin down anything he does. "Each song means something different to different people at different points in their life," Pittman said. "Hopefully, people take the idea that it's never too late." He carries a very similar message when he lends time to Little Kids Rock and other charities. As an example, Pittman visited one middle school last year to help raise over $7,000 for the organization. The aim of the program is to revitalize music education in disadvantaged schools. "For me, it's a way to teach a lot of kids at once," he said. "It also allows me to bring attention about the needs of all the kids out there that crave a musical education but don't have the tools they need." Pittman isn't against learning either. Prior to the release of his first album (and sometimes at random), he plays open mic nights around Los Angeles. Originally it was a means to overcome his trepidation about singing. He knew, even then, that iconic performers carry larger audiences but solo performers are much more exposed to intimate ones. "It's the absolute worst predicament you could be in and you still have to make it work," he said. "You plug in your guitar and go." And once you go, there is no chance of turning back. He says aspiring musicians ought to do something similar, placing more faith in their instincts instead of "people who focus on why you shouldn't do something simply because they don't want you to do it." Instead, he says, treat your coworkers, bandmates, and fans with the highest respect. There are more important things to be concerned about — the business and the music. "Usually, songs just pop in my head like a curse," says Pittman. "It happens when I'm playing the guitar and I come up with a chord progression or a riff. If it's good, it sticks in your head until you lay it down or make a demo. And then, you keep building it." Pain, Love & Destiny By Pittman Soars To 4.6 On The Liquid Hip Richter Scale. Pittman has proven his presence as a solo artist, picking up Best Solo Artist honors at the Artist In Music Awards. He is also nominated for Best Male Singer/Songwriter for the Los Angeles Music Awards, but even more interesting is his new signature Jarrel guitar, the MPS, which he designed with as much diversity as his career has offered him. Outside of the songs mentioned (and maybe Lost or Burn Down The Garden), it would be great for Pittman to dirty up his studio sessions and power up his vocals on stage. He already has two parts down. He's a solid songwriter and a guitarist with guts. Pain, Love & Destiny by Monte Pittman is available on iTunes. Pain, Love & Destiny can also be found on Amazon. Incidentally, Pittman funded his second album with the help of Kickstarter. He asked for $5,000 and raised $65,000, setting a new record among rock soloists.